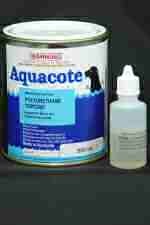 Reviews: Aquacote Topcoat 500 ml : Boatcraft Pacific, the home of wooden boat building. I used Aquacote to repaint an old glass puffin Pacer. What a great product to use. Easy to apply using a foam roller. Good coverage. Easy clean up. The boat has been in use for nearly a year being dragged up and down a beach. Pulled on and off a trailer but has only minimal marks. I am going to use it to re paint an OK dinghy i am rebuilding. For once a product that works as advertised.